Interior designer and influencer, Amira from @Dusktildawn, shares her tips for bringing Autumn into your home. Autumn brings with it beautiful warm colours that create such a cosy ambience around the home, the sun shining while a soft cool breeze is in the air. Autumn is all about adding elements of nature and Rustic hues to your existing décor. Including a beautiful and warm colour palette. Soft Mustards, Terracotta, Rust along with a lovely sage all scream Autumn! Colour is what makes the room inviting and cosy. Tip: Use a neutral approach for large furniture items and experiment with seasonal colours to create a warm and welcoming home. ‘Furnishings’’ – rugs, throw blankets and lots of cushions. During Autumn opt for all things knitted. Knitted throw blankets, mixing and match cushions have always been my way of adding texture to a room. Subtle florals, paisley prints and mix them through some plain colour cushions to create an inviting space. The pattern can be used in anything; the rug, cushions or even a throw blanket. Getting creative and seeing what works. During Autumn use wicker baskets & lanterns to create a cosy vibe. 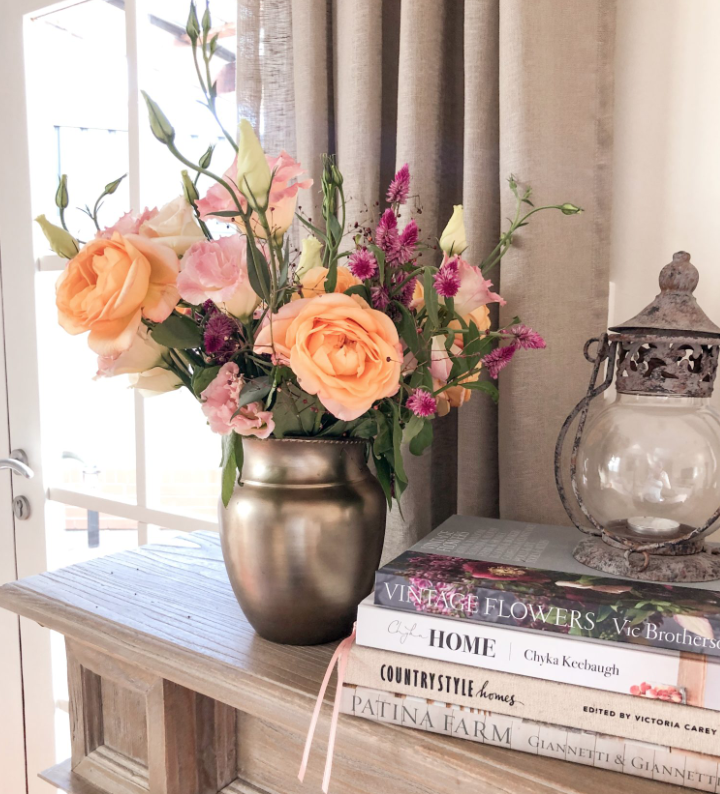 Lastly, decorating with natures beauty must be one of my favourite aspects of styling my home! Flowers bring me so much happiness that having them in my home every week using Petal Post, a flower subscription service has been amazing!